This comes as Grace is already under serious police investigation after being implicated in the smuggling of the country’s ivory stocks, with sources within the justice system also telling the Daily News yesterday that there were several other ongoing probes targeting the former first lady — who was accused of effecting a “bedroom coup” at State House in 2014. Among Mugabe’s remaining associates who fear that President Emmerson Mnangagwa’s government may be planning to arrest the increasingly disorientated 94-year-old and his wife are self-exiled former Cabinet minister Jonathan Moyo — one of the alleged kingpins of Zanu PF’s vanquished Generation 40 (G40) faction — as well as the fledgling new opposition party that has the backing of the nonagenarian, the National Patriotic Front (NPF). NPF spokesperson, Jealousy Mawarire, confirmed yesterday that they had written to regional bloc Sadc, urging it to intervene and save Mugabe from alleged “harassment”. “The harassment of Mugabe and his wife, especially the contrived ivory smuggling allegations, are clear moves by a desperate junta to tarnish the image of the two, after Mugabe came out in the open revealing that ED (Mnangagwa) and (Vice President Constantino) Chiwenga staged a coup on November 15, 2017 — and that the current government is therefore illegitimate. “The junta was also riled by the fact that Mugabe is prepared to support NPF if we fight for a return to constitutionalism and ensure that politics leads the gun, not the current situation where guns were used to illegally topple a democratically-elected government. “It is common cause that Mugabe and his family were under house arrest in December 2017 when the purported ivory smuggling was done, so the soldiers that were holding the family hostage should tell us how their captives found time to involve themselves in the purported ivory trade,” Mawarire charged. The well-placed sources who spoke to the Daily News yesterday said the current investigations into various dealings of the Mugabe family had been going on for the past three months, with authorities apparently sitting on several “hot” dockets that did not portray the former first family in good light. But Mawarire claimed that the allegations were “purely political harassment as a result of the first family’s alleged links to our party”. “If Zimbabwe is open for business, it should be open to political business. Hence, people — regardless of their past positions in government — should be allowed freedom of association, choice and expression. “These rights are fundamental to the freeness and fairness of the forthcoming election, and we hope ED goes beyond his mantra of a free election and acquaints himself with the Sadc guidelines and principles governing democratic elections in the region. “These are very clear on what constitutes a free and fair election and we believe he should leave ... Mugabe and his family to freely participate in the next elections if they so wish, because it's their constitutional right to do so ... we have engaged regional powers to look into the matter of Mugabe,” Mawarire added. In its letter sent to regional leaders, including former South African president Thabo Mbeki — infamous for claiming a decade ago that there was no political crisis in Zimbabwe — the NPF warned that if Sadc leaders choose to ignore Mugabe’s current situation, there could be serious consequences for both the country and the region. “If you ignore this ... you will ignore the Constitution of Zimbabwe, history and your responsibilities and obligations as Sadc, and the consequences will be too ghastly for everyone concerned, in Zimbabwe and in Sadc and the African Union,” reads part of the NPF letter. The curtain fell on Mugabe last year on November 21 when he resigned moments after Parliament had started damaging proceedings to impeach him. This followed a military intervention that was code-named Operation Restore Legacy, which saw the nonagenarian and his then influential wife being placed under house arrest. Several Cabinet ministers linked to the G40 faction which had coalesced around Grace were also targeted in the operation, which ended just before Christmas — with the military only retreating back to their barracks after five weeks of executing the operation. The annihilated G40 — with the visible help of Mugabe and Grace — was, before the military intervention, locked in a bitter war with Mnangagwa and his supporters for control of both Zanu PF and the country. Moyo used micro blogging site, Twitter, at the weekend to also appeal to serving and former African leaders — including Paul Kagame of Rwanda, Cyril Ramaphosa of South Africa, Mbeki, Benjamin Mkapa of Tanzania, Olesugun Obasanjo of Nigeria, Yoweri Museveni of Uganda, and former United Nations secretary-general Kofi Annan — to help Mugabe. “HE P. Kagame; HE C. Ramaphosa; HE T. Mbeki; HE B. Mkapa; HE O. Obasanjo; HE Y. Museveni & HE K. Annan. Coup rulers in Zimbabwe are persecuting your brother, Mugabe. Please check on him! 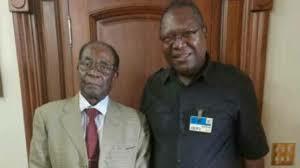 “It's impossible for Zanu PF to win Zimbabwe's 2018 elections. Zanu PF is no more. What was Zanu PF was killed by the 15NovCoup and replaced by an unelectable Lacoste Junta. To remain in power, the Lacoste Junta will have to do another coup. Only EDiots think that would succeed, again,” Moyo raged. Meanwhile, the former Higher Education minister, who is now living in self-imposed exile, is himself facing a slew of criminal allegations — which include corruption, fraud, money laundering and criminal abuse of office charges, as well as claims that he irregularly benefited from Zimbabwe Manpower Development Fund (Zimdef) donations that involved the purchase of bicycles which he donated to his former Tsholotsho North constituency. The Zimbabwe Anti-Corruption Commission (Zacc) has said that the donations of the bicycles was not done above board. The anti-graft body further claims that Moyo, his then deputy Godfrey Gandawa, and Zimdef chief executive Frederick Mandizvidza, were at the centre of multiple corrupt and fraudulent activities running into hundreds of thousands of dollars.